To dress in Massimo Dutti is to become Euro light: you'll achieve just the subtlest whiff of continental flair, but avoid the overwhelming, nostril-burning sting of, you know, actual European dudes. The brand's something of a European J. 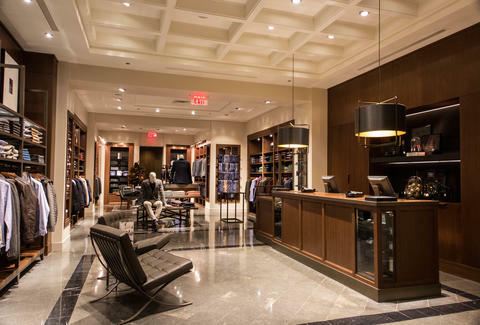 Crew, and the Gtown store -- all walnut shelving and leather chairs and St. Vincent marble flooring -- is their second US location after New York. Like the European fashion mullet, their suiting department will make you all business in the front with made-to-measure cotton/ wool/ cashmere two-piecers, but will invite a party underneath with crazy lining colors, buttons, and felts (...so really it's like a European fashion layered haircut or something, but whatever). 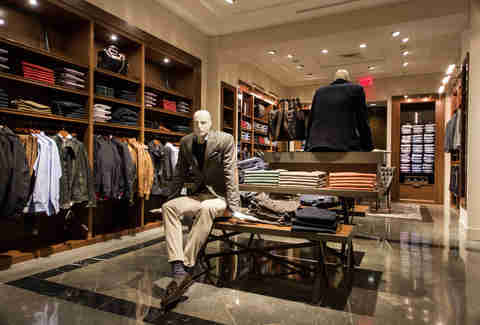 Beyond that, it's stylish slim fit "city" jeans with stretch denim, blazers that're all herringbone & elbow patches, and heavier duty outerwear sporting details like toggles and "Tuscan hoods", which are also the square blocks in Tuscany where the villas go for under $2.5mil, and feature grounds stretching only a hectare or two. Eww. There's also a wall in the middle dedicated to accessories like two-tone goat leather gloves, and suede-finished, hand-stitched dress shoes, so you can look like the sh*t, as opposed to just smelling like it.